There are many interesting yet irritating conditions you may experience during your run. One of the most puzzling is having a sore throat every time you run. A sore throat while running can affect your performance negatively. 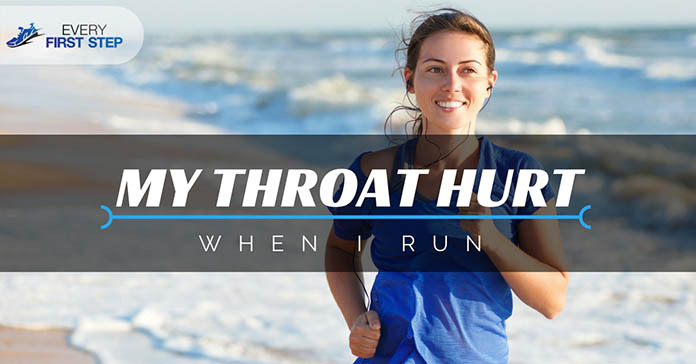 The question you desperately want to answer is why does my throat hurt when I run? The answer is not what you may think. In this article, we will discuss the three main causes of a sore throat when running. Why does My Throat Hurt When I Run? You have probably heard that when you run, the more air you can get into your body, the better. For this reason, breathing through your mouth and nose may become your habit. There is a reason to believe that mouth breathing may trigger a sore throat when you run. When we breathe through your mouth, the air you inhale is dry and cold. When you run, you breathe more rapidly which means your throat is likely to get irritated because of the dry air passing. Breathing normally through the nose, on the other hand, allows the air to get warmed and moist before it gets to the throat. Dry membranes become sensitive and can easily be invaded by bacteria. If you breathe through your mouth when running, your throat is more prone to be irritated by pollutants. Your nose is designed with mucous membranes which help to clean the air before it reaches your throat. Your nose also makes nitric acid which helps kill bacteria and viruses. When you breathe through your mouth, you lack this important gas and this can lead to developing a sore throat due to infection. Running in cold weather is another possible cause of your sore throat. Cold air is dryer than normal air and can easily irritate the nasal passage and throat when inhaled. Running during the cold season means you are inhaling a lot of cold air in a short period of time. If you don’t have any protection like a mask or scarf, you may end up damaging your nasal, sinus or bronchial tubes in a few minutes. In worst cases, you may end up freezing your sinus cavities which may easily cause long-term throat problems. If you don't have anyone sick around you and get this pain in your throat and even chest, it may because of the cold air you inhaled. When you have cold airways, you will be more susceptible to infection due to the inflammation of your throat tissue. Your throat tissue may be ‘burned’ and inflamed which means you will experience discomfort until they are fully healed. During this process, you may also develop a running nose, cough, and phlegm. Interestingly, running in dry weather causes the same effect as running in cold weather. Dry weather makes the air you breathe dry which in turn irritates your throat and airways. The dry air absorbs moisture from your skin and body which can cause the irritation in your throat. When the sensitive membrane in your nose dries out, the moisture in your throat also dries out. With a dry throat, allergens in the environment such as pollen can easily cause irritations. Although these three reasons may cause a lot of discomforts, the good news is that it can be prevented. Here are some easy ways to prevent a sore throat when running. Use a scarf over your mouth or a mask to reduce the coldness of the air when running outdoors in cold weather. Failure to wear proper clothing in cold weather may trigger other serious conditions such as lung problems which may manifest itself as chest spasms causing you to feel like your heart﻿﻿ ﻿﻿is hurting. When your airways react to change in temperature, they contract creating a spasm that creates a tightness in your chest. As we have learned, there are three main causes of throat pain when running namely, breathing through your mouth, running in cold weather and running in dry weather. If you find yourself with this condition after you run, immediately try and alleviate the pain by using home remedies. In the future, make it a point to follow the preventive measures mentioned.